The business landscape in Russia has changed in the last decade and, now, more and more foreign nationals are starting businesses in the country, attracted to the opportunities for growth and space for new ideas in the Russian market. Foreign entrepreneurs doing business in Russia shared with RBTH their experiences and advice. Before the mid-2000s, people from developed nations had a widespread belief that doing business in Russia was possible only for international corporations, as rumors about its enormous corruption and local ways kept potential entrepreneurs away. According to data provided by the Federal Tax Service of Russia (FTS), in 2005, less than 15 percent of small businesses registered by foreign citizens did not involve entrepreneurs from CIS countries, who were actively developing the trade market segment at that time. In large cities and regions today, one can more and more often find services offered by entrepreneurs from almost every corner of the world. According to the FTS data for May 2013, about 25,000 foreigner nationals work in Russia on a Sole Proprietor License, with CIS citizens accounting for 60 percent of these licenses. For instance, in Moscow and St. Petersburg, one can find bakers from France, restaurateurs from Japan or the former Yugoslavia, a fashion boutique owner from Italy, and even an architect from Morocco. Russia Beyond the Headlines tried to find out just how difficult it may be for foreigners to start a business in Russia. “Why I decided to start my business in Russia? Here, unlike in the EU member states, no one complains much about the global crisis, and the taxation system is more or less moderate — six percent income tax for individual entrepreneurs,” says Marouan Sbai, an architect from Morocco who has been residing in Russia since 2004. Michelle Bolognani from Italy, having already spent five years in Russia, also sticks to this opinion. About a year ago, she and her Russian friend opened a small fashion-clothing store in Moscow. “Unlike in satiated Europe, Russia has enough space for almost any idea. The most important thing is that this market has really crazy dynamics, so the business is developing at a rapid pace,” says Bolognani. In the last 3–4 years, Russia began active work on improving the country’s business climate by reforming its legislation, simplifying official procedures, etc. In 2012, this helped the country to move from position 120 to position 112 in the Ease of Doing Business Index established by the World Bank; by 2020, Russian President Vladimir Putin plans to move Russia into the top 20 on the list. At the moment, the leading positions in this rating are occupied by Singapore, Hong Kong and New Zealand. The main difference between an LLC and an SP is in the registration procedure. 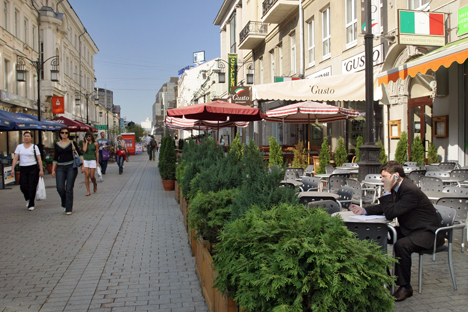 In order to become a Sole Proprietor, you need to pay the state duty of 800 rubles ($25). For registration as an LLC, an authorized capital of at least 10,000 rubles ($309) is required, as well as a written company charter. An SP registration for foreigners is possible only after receiving a work permit with the right to work in Russia. A foreigner must have temporary or permanent registration (i.e., a home address) in Russia. Such optimization concerns business registration, filing with non-commercial organizations and other red-tape procedures. Just five years ago, registration at the tax inspectorate could have taken an entire day. Now, thanks to electronic queues and precise work regulations for tax service officers, this procedure will claim only an hour of your time. “The most important thing is careful preparation of all documents required to obtain a Sole Proprietor License: a notarized translation of a foreign citizen’s passport, temporary residency permit or permanent residence permit, and a receipt confirming payment of the state duty of 800 rubles [$25],” says Sbai. One should remember that, in order to operate in the country, one must obtain a corresponding visa and residence permit. Most foreigners decide to move to Russia after working in the country for some other company. “I decided to register as a Sole Proprietor, because registering another legal entity — such as the Limited Liability Company (OOO) — requires more documents, and the taxes are higher as well. Such a legal entity is better when starting a business with a Russian partner,” Sbai says, sharing more of his experiences. To register a legal entity, one can turn to a company that specializes in providing legal services to foreigners. “I studied at the Moscow Institute of Architecture and, hence, I know the language well; still, I contacted a law firm to examine all the papers,” Sbai says. The average price of a consultation is 5,000 rubles ($155). The amount of initial capital required to start a business in Russia certainly depends on the specific kind of activity. “However, going to a new place without having a spare €10,000–15,000 is not advisable, even if you are a designer and you do not actually need investments,” say the entrepreneurs interviewed by RBTH. This is especially true since, first, you have to get settled in, find accommodations, etc. The cost of renting an apartment depends on the city in which you want to live. While in Novosibirsk or Yekaterinburg a small, furnished apartment will set you back up to 10,000 rubles per month ($310), Moscow prices start at 25,000 rubles ($775). In addition, any businessperson will have to learn Russian. “Without knowing the language, you will not achieve anything, no matter if you are in Russia or in any other country. You need to talk to customers in their language,” says Yolanta, a business owner from Lithuania whose company operates in both of these countries. What can cause problems for those doing business in Russia? There are many things, according to the businesspeople interviewed by RBTH. It could be the constant bureaucracy and corruption risks: For example, when leasing premises, one will have to go through multiple inspections by the fire department, sanitary and epidemiological inspection service, and so on. However, these types of red-tape obstacles are also present in China and Europe. “Before moving in and investing into registration of a legal entity, you need to draw up a business plan — evaluate the peculiarities of the region and the field you would like to operate in,” says Andros, 32, from Greece. Two years ago, he tried to open a vegetable store in Moscow, but he went bankrupt, having miscalculated the toughness of local competition. “I lost little money, because I managed to stop at the right time. And now I am gathering more experience to try again!” says Andros.